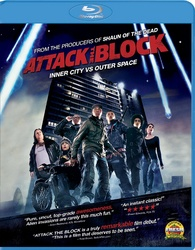 ‘Attack The Block’ Blu-Ray Announced and Detailed!!! One of my favorite films of the year has been announced and detailed for its October 25th release on blu-ray. I just fell in love with every aspect of the film. Read my REVIEW HERE!!! Looking forward to this. It’s going to look superb in hi-def. Look below for all the details. ‘Attack The Block’s’ Joe Cornish to Direct ‘Section 6’!!! Edgar Wright’s ‘The World’s End’ Blu-Ray Announced!!! This entry was posted on Wednesday, September 21st, 2011 at 12:50 am	and is filed under Film. You can follow any responses to this entry through the RSS 2.0 feed. You can skip to the end and leave a response. Pinging is currently not allowed. « The Finale is Here!!! Harry Potter And the Deathly Hallows Part 2 Blu-Ray Announced and Detailed!!! Yes, John, I've heard all about the Emperor. Must be one hell of a man. Are you kidding me? You're sitting here, waiting to die for someone whose balls haven't even dropped?